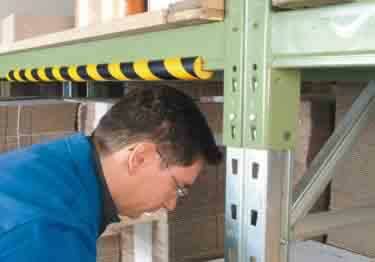 Protect employees from injury from protruding corners, edges, and objects with Safety Bumper Guards. Designed to protect equipment and walls, increase safety, and reduce work related injury, these Safety Bumper Guards are made from flexible polyurethane foam that absorbs the force of impact and gently bounces back. Protecting both your employees and your equipment! Available in seven types and a variety of colors, including a photoluminescent version that provides long-lasting luminance for increased visibility in sudden darkness. All guards except Type B are self-adhesive. Photoluminescent/Red - indoor use only. Soft yellowish color during the day, lights up with a yellow glow in the dark. Black foam. Photoluminescent/Black - indoor use only. Soft yellowish color during the day, lights up with a yellow glow in the dark. Black foam. Fluorescent + Photoluminescent/Black - indoor use only. Day light flouresence that is bright and alerting combined with a darkness photoluminescent glow/contrasting black. Power is 140 luminance. Black foam. Reflective - this color is very bright and visible when vehicle headlights or flashlight beams shine on it. Stop costly destruction & injury caused by impact to workplace corners with Bumper Corner Guards. Durable with a flexible polyurethane. Protect walls, equipment, machinery & employees from impact injury with durable foam. Available in 6 colors, 5 types, & 7 sizes.